In 1965 the present plant was completed and dedicated to the service of the Lord. These facilities are used to teach not only the principles of the Christian religion, but to teach all subjects in the light of God's Word. In this institution, there is a complete correlation of all subject matter, and hearts as well as heads are trained for service to God and man. We have an experienced and dedicated group of teachers and administrators. Each teacher strives to create a supportive and challenging classroom atmosphere to encourage students to participate. We may introduce a teacher or student on this page, or have a teacher or student of the month feature like the one below. 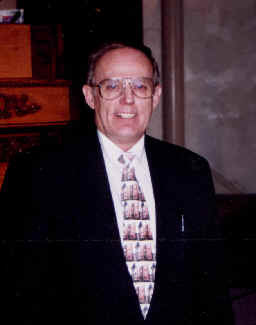 This month's featured teacher is Bro.Ralph Hebblethwaite. Bro. Ralph has taught at our school since 1960. While he enjoys teaching all ages of students, he is currently the teacher of our High School students. In 1961, he married Carol Bye. He has one daughter, Kelly, who attended all 13 years at St. Louis Christian Academy and currently teaches there. He has two granddaughter's, Hannah and Isabella.